The increase in fatalities has been largely among bicyclists, motorcyclists, and pedestrians—all of whom are easier to miss from the driver’s seat than, say, a 4,000-pound SUV—especially if you’re glancing up from your phone rather than concentrating on the road. Last year, 5,987 pedestrians were killed by cars in the U.S., almost 1,100 more than in 2014—that’s a 22 percent increase in just two years. This article seeks to put the blame for the recent rise in road fatalities in the US on rising smartphone use, especially for texting and data transfer. Pedestrian deaths rose 22% and cycling deaths 15% between 2014 and 2016. If the authors are right, I’d expect a similar trend in Australia given we’re a society of technologically advanced consumers who also drive a lot in predominantly suburban cities. At first glance, the Australian Road Deaths Database seems to confirm the experience in the US; road fatalities also increased markedly in Australia over the 2014 – 16 period e.g. pedestrian deaths went up 20% (see exhibit). However contrary to the US experience, cyclist deaths fell by a third (-36%), suggesting that relying on such a short time period is misleading. If we look at the pattern over a longer timeframe, it’s quite different. Between 2011 and 2016, total road fatalities in Australia increased in absolute terms by just 1% and decreased for both pedestrians (-3%) and cyclists (-15%). That’s a significant improvement because the population increased by 1.9 million, or 9%, over the same five-year period. If the pattern for the first nine months of 2017 is maintained until the end of the year, total fatalities will fall by -6% relative to 2011. The only increase will be in motorcycles, although it will be a modest 2% over six years. Unless Aussies are better multi-taskers, I think the reasoning in the article is questionable. The author relies heavily on an increase in fatalities over just two years when an alternative explanation is a short-term fluctuation (for a local example of journalistic selectivity with crash statistics, see Is cycling on roads getting safer?). Increasing densities in established areas and around employment centres to make better use of existing infrastructure. Introducing a comprehensive and fair transport network pricing regime to manage demands on the network. Investing in social housing and other forms of affordable housing for vulnerable Victorians to significantly increase supply. The 30-year Infrastructure Strategy was published in December 2016. Last week the Andrews Labor Government got around to releasing its response, the five-year Victorian Infrastructure Plan. The Government says it’s accepted “in full or, in-principle, or partly supported” 134 of the 137 recommendations made by Infrastructure Victoria. It can claim to support almost every recommendation because it knows it won’t be around to carry the can in the longer term for the expensive ones. It gets another opportunity to publicise its existing four-year infrastructure program. Of course, it’s hard for the Government to commit the State to anything long-term when the budget cycle is only four years and so are parliamentary terms. But that’s not why it rejected outright Infrastructure Victoria’s headline recommendation on road pricing the day after the draft report was released twelve months ago; that was about politics. It’s the government, so that’s it’s prerogative, however it doesn’t have an alternative answer to the issue of congestion. Instead of effectively closing down debate on road pricing with its defensive response, it could’ve helped to advance discussion by taking a more conciliatory and open-ended position. North East Link is a high cost project requiring a substantial lead time, so delivery may not be feasible much earlier than 10 years. If we had a choice between accelerating this project and the many smaller programs overleaf, we would prioritise the latter. The “smaller programs” relating to transport cited by Infrastructure Victoria include Fishermans Bend tram; Growth area local buses and Regional city local buses; Outer metropolitan arterial roads; Cycling corridors/walking improvements; Transport interchanges; Metropolitan bus network; SmartBus network; Doncaster bus system; Melbourne airport bus; Road space allocation. The Government has made no commitment in its draft Plan to provide priority road space for either SkyBus or Doncaster Area Rapid Transit over the next five years. Infrastructure Victoria found there are “between 75,000 and 100,000 vulnerable, low-income households (who) are not having their housing requirements appropriately met”. The Government’s draft Plan generates plenty of smoke on social housing, but there’s no sign of the sort of fire implied by Infrastructure Victoria’s nomination of social housing as a top three priority. The establishment of Infrastructure Victoria was an important and worthwhile initiative, but it hasn’t ‘solved’ the problem of how politics compromises infrastructure planning. The big challenge is to find a way to build an enduring consensus around what infrastructure projects should get priority over at least the medium term, say over two or three parliamentary terms. This is consistent with what everyone I know assumes is the case. Compared to public transport, a trip by Uber is quicker, more comfortable, and more convenient, especially at night. The same goes for taxis. While it’s a lot more expensive than public transport, it’s only occasional. But let’s be careful here before rushing off to increase regulation of hire cars. The problem isn’t primarily with Uber and taxis; after all, travellers who use these services must consider the fee per kilometre/minute before deciding if the trip is worth it. The problem is mainly with all the private cars on the road where the drivers face a very low marginal cost i.e. low disincentive. On Third Avenue, where Adelita Ortiz’s routes usually begin, her only traffic obstacle is a stream of other buses traveling down the road. The street blocks off cars and becomes a transit-only corridor during the morning and afternoon rush hours (private vehicles are supposed to turn off after a block on the street). Buses are the poor cousin to rails when it comes to getting priority over cars in Australian cities. Yet they carry more Melburnians on weekday trips than trams. In Sydney, they have a larger mode share than trains. No surprise then the Victorian Government squibbed on improving on-road priority for SkyBus or for Doncaster Area Rapid Transit buses in the draft Victorian Infrastructure Plan released during the week. A new study inspired by Boston’s early experiments with self-driving cars finds that the technology could ease congestion, but might also lead to more cars on the road and further encourage urban sprawl. The study was done by the Boston Consulting Group and the World Economic Forum. The pejorative “sprawl” is unfortunate because it hides the bigger issue; longer travel distances/times and hence more cars on roads in all parts of the city. The study reinforces the importance of ensuring fully autonomous vehicles are only permitted in cities on the basis (a) they’re not privately owned i.e. they operate as “hire” vehicles (like taxis), and (b) passengers pay for their use of road space e.g. by time and distance. Local traders on Acland St have said last year’s upgrade has killed business and taken away the “soul” of the iconic St Kilda strip. Acland Cellars manager Ben Muller, who has worked on the street for nine years, said the upgrade had turned the vibrant space into a dead zone. “Basically, they have gambled and said that everyone gets to Acland St via public transport, and as a result, we have had probably a 20 per cent decrease in business, and we have been here for 33 years,” Mr Muller said. There’s a trade-off between accessibility and amenity. Planners and Councillors favour the latter but take no personal risk. Businesses cop the risk and are nervous and conservative about removal of parking spaces. The concerns of businesses tend to be dismissed in the political enthusiasm for the project, even though they’re the ones that attract the customers (it’s mostly not the beach). There’s also a big question about how well those who undertake traffic studies understand the commercial implications of changes. My feeling is businesses not only have most skin in the game but are the main attraction; they ought to get a bigger hearing. Central to the new agreement are tough new rules that stop oBikes from obstructing access to footpaths and fixed bicycle parking rails. oBike must ensure its 1250 bikes on Melbourne’s streets are (1) always parked upright (2) not dumped at a single location, with no more than six bicycles per 200 metres allowed, and (3) not left on steps, ramps, traffic islands, trees, buildings or light poles. The dockless bikeshare model presumes the cost of storing bikes is met by the community, mostly by way of occupying public spaces. That’s fair enough if bikeshare delivers on its private and social promise; in that event I’d be looking to councils to provide active support, like reassigning parking spaces from cars to bikes. The great advantage of the scheme – storing bikes anywhere and everywhere – also means the cost of security is impossible, so the bikes are vulnerable to vandalism and anti-social behaviour. I suspect oBike is a marginal operation in Melbourne with limited capacity to meet its current costs, let alone absorb the additional costs now imposed by councils. But even without these added demands, it’s never looked like it can deliver on the promise. oBike’s got plenty of members but, it seems, very few users; it’s not doing anything to reduce car trips. That’s down to several reasons, including the helmet law, the unfriendly design of the bikes, availability of competing modes, size of the fleet, and the reluctance of non-regular riders to cycle on roads with traffic. Regrettably, I don’t think dockless bikeshare can work commercially in Australian cities at this time. Not yet, anyway. At least it’s the venture capitalists who’re (probably) going to lose their shirts, not taxpayers. Moving from a two-car household to a one-car household cuts weekly costs by as much as A$41, even after increased public transport use adds a A$41-a-week cost. Moving from a two-car household to having no cars can improve weekly finances by as much as A$237, after adding 10 return trips to the CBD. 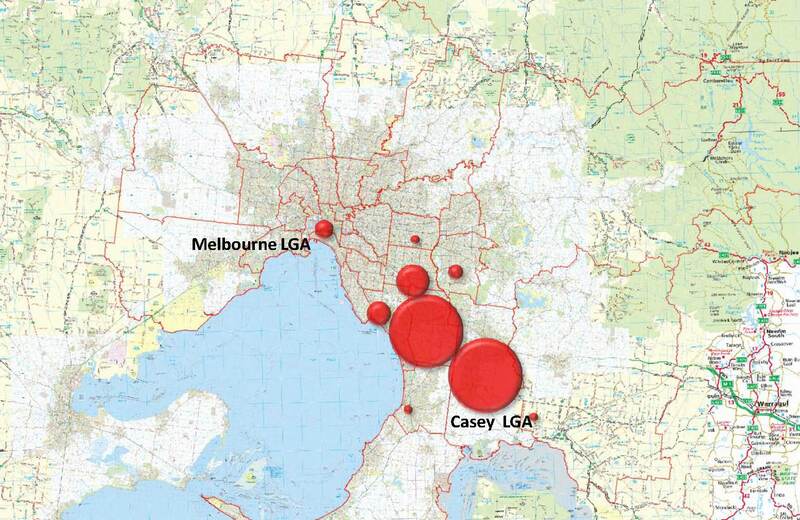 Assume outer suburban workers commute to the CBD when in fact very few do; the great majority work locally – see The jobs are already in the suburbs (especially this map). Assume CBD workers drive. No; the few that do work in the CBD overwhelmingly travel by train because it’s much faster than driving. Ignore the value of time, convenience, and comfort that those who commute by car – overwhelmingly to jobs in the suburbs – get from driving. Don’t “get” that outer suburbanites will only use public transport in significant numbers if it comes close to matching the travel time and predictability of driving to the same destination. Don’t know that lower income outer suburbanites tend to locate close to centres where public transport and walking are viable options (see Transport disadvantage in the suburbs). The very high rates of car ownership in middle and inner ring suburbs – where public transport is a much better option than on the fringe – show that Australians value cars and still find them useful. They don’t drive because they’re denied the option of public transport; they prefer to drive. Another very important consideration is households settle on the fringe so they can get the benefits of home ownership, including the considerable longer-term financial benefit. Those benefits must be included in any analysis of the cost of location. According to the motor vehicle census the number of registered passenger vehicles in Australia has increased by 43 per cent since the turn of the century. This compares with an increase of just 27 per cent in the human population… More than 90 per cent of the Australian population lives in a household with access to a car… A little more than one-third of households have access to one car; a further 54 per cent have access to between two and four cars. Two per cent of households (178,000) have access to five or more cars. This article by Bernard Salt provides a wealth of statistical information describing the hegemony of the car in Australian cities. Extraordinary that policy-makers and planners alike persist with the ludicrous fiction that we can somehow magically build so much public transport infrastructure that drivers will choose en masse to become transit riders. No, cars aren’t going away; we’re driving more than ever. We have to tame cars, not get caught up in the collective delusion that we can eliminate them (see Does driving matter for a city’s liveability?). You have to understand a problem for what it is before you can deal with it.